With our lives being so connected these days, most of us spend more time using our web browser than any other computer program. A great browser makes for the best Internet experience, so choosing the right one is a necessity. And right now both PC and Mac owners have a lot of choices. There are the default browsers, Safari and Internet Explorer, plus dozens of others that work on both platforms. What makes any of them better than the others? The best browsers are simple to use, speedy, hog as few computer resources as possible and keep you safe from malware and third-party tracking. On top of that, browsers should offer a wealth of customization options, tight integration with sites and services you use often, robust tab and window management, and syncing across computers and mobile devices. There are five browsers that have most or all of these qualities: Google Chrome, Mozilla Firefox, Internet Explorer, Safari, and Opera. Of these, Chrome and Firefox offer the best experiences across the board and have the advantage of being available for all major operating systems and many mobile devices. After using both browsers extensively for over six months, I found Firefox to be the superior browser. Read on to find out why. If you're familiar with Firefox from years past, you might balk at my recommendation at first. Firefox was once a top browser alternative but lost a lot of popularity and users to Chrome because it grew too slow while hogging a ton of memory. It took a while, but Mozilla's developers finally turned this problem around. It's secure, fast, easy to use and customizable, uses few computer resources and makes switching between computers and mobile devices easy. Firefox has the most robust and useful library of add-ons for its browser, making it the most customizable and useful browser. 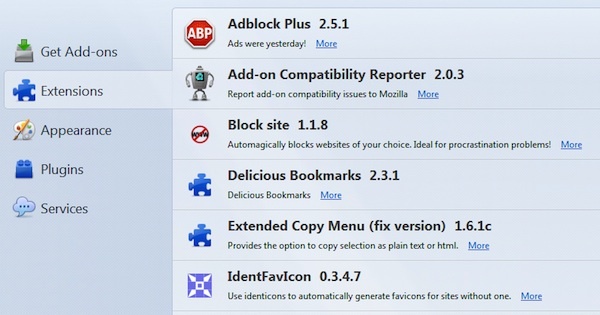 It has all of the most popular extensions and plugins—ad blockers, adjuncts to popular services like Evernote and Pocket, social network integration, etc.—plus some very useful add-ons that are only available for Firefox. For instance the Heartbleed checker for Firefox, Heartbleed-Ext, adds a red warning at the top of vulnerable sites. Plus, all of the add-ons you find in the official Mozilla repository (found under Firefox >> Add-ons) are checked for compatibility and malware, unlike Google Chrome's extension library. Add-ons won't add new or malicious functionality behind your back the way some Chrome Extensions have been accused of. By default, add-ons update automatically as the browser checks for new versions and security patches, but you can disable that so you can approve all updates. To create a Tab Group, you use the Tab Group short cut--"Ctrl + Shift + E"
If you like to keep multiple sites open in multiple windows or tabs, Firefox's built-in tools for managing them are the best. The Tab Groups feature makes keeping tabs organized much easier and clears away the clutter that comes with having dozens of tabs open in one window. 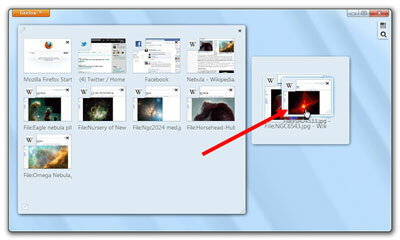 You can group tabs any way you like and even name the groups so you remember which websites you have stored inside. Switching between groups is as easy as switching between windows, but everything stays under one icon. In Firefox you can also "pin" a tab (right click on a tab pin it), which moves it to the left of other tabs and keeps it in place permanently, even after you restart. This is useful for websites I keep open and check often, such as Gmail and Facebook, because I can always find them and see notifications. 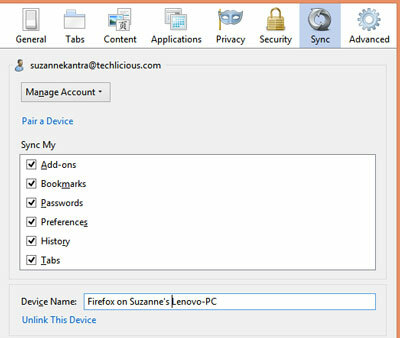 Besides keeping your plug-ins updated, there are other ways Firefox keeps you secure. The browser is automatically updated to ensure you have the freshest protection while surfing. If you come across a malware-infected site or a fake site designed for phishing, the browser will warn you before loading. This list of bad sites is kept up to date as new fakes and infections pop up. Mozilla improved on Firefox's private browsing experience. Now it works similarly to Chrome--private windows open alongside normal ones, so you don't have to close down what you're doing to go incognito. However, you can't open multiple sessions in private windows as you can with Internet Explorer. If you're signed into one Yahoo Mail account in private, you can't sign into a second account in another private window. The ability to sync browser data is increasingly important for people who spend their day switching between devices, be they mobile phones, tablets, or computers. It's nice to be able to reopen tabs from your computer on your phone, especially if the tab has needed information. I also appreciate having all my bookmarks, passwords, and add-ons on both my work and home computer. Firefox, Chrome, Internet Explorer and Safari all have some syncing capability, though the first two have the best and most comprehensive implementation. Setting up Chrome's sync is easier and faster than Firefox because all you have to do is sign in to your Google account and you're done. Firefox has a code verification system that requires using an existing synced device to authorize another, which is a minor pain. Syncing works on Android smartphones and tablets, too, since both Chrome and Firefox have mobile versions on that platform. However, there's no Firefox for iOS. Chrome is available for iPhone and iPad, though Safari is naturally more integrated with those devices and you can't change the default browser to Chrome in iOS. Firefox is now back to being the best browser choice, thanks to recent updates and added features. It's secure, streamlined, customizable and makes switching between computers and mobile devices easy. I have used Mozilla Firefox until the recent politicizing of their company by taking an anti-traditional marriage / hetrophobes stance. I think it is too bad when a company throws the majority opinion of their customer in the trash for some politically correct choice. Mozilla is just responding to their customer’s newly evolved outlook that people are people and who gives a s**t who you marry? I’m not going to marry another guy, but who the hell are any of us to say, “no you can’t”? Am I a heterophobe now, Joey? Honestly, it just blows me away that anyone cares who anyone else marries. Just do no harm, be a good person in this short life we’re given and for God’s sake, use FIREFOX!! It isn’t that, nor was it of the opinion of the Founder of Mozilla and former CEO…it blows me away that you would be in 100% agreement with anybody that thinks it’s ok to terminate one’s livelihood based upon his own private thoughts and/or opinions but worked diligently not to extend that to the public, nor the workplace. SO Misguided. You miss the point entirely. I don’t care to get into a discussion on marriage, but I do care very much about a browser company that will give into activists pressure to censor views they don’t agree with. People have a right to support gay marriage. They also have a right to donate money to organizations that support family values. A browser company should NOT take sides. Their whole purpose is to be neutral. BTW the CEO DID NOT oppose gay marriage, he simply donated money to an organization that supports family. One of their positions was an opposition to gay marriage, but that is only one small piece of what they stand for. Is this the way you think a free country should work? You destroy and censor anything and anyone you don’t agree with? I’m curious where you get your definition of “traditional” marriage? Let me take a wild guess - the Holly Bibble? Organized religion has been the worst thing that ever happened to the human race. Until it is gone we will never evolve. How about you do everyone a favor and keep your religion in your church. Curious, it’s no wonder you are so easily manipulated by the propagandists. You just assume and parrot. I’ll bet you have a lot of other inaccurate assumptions about every group you don’t agree with. Did you ever try digging out the facts? OH MY GOSH! Facts just tend to destroy what you choose to believe. 1) A little reading will teach you that marriage was around long before the bible. The ancient Egyptians married long before Moses was born. 2) The concern here has nothing to do with marriage. It has everything to do with censorship and intolerance by a browser company that is not suppose to take sides on any issues. Gay marriage is okay because it allows for those who want to become married to become married. You don’t have to marry a man just because it is legal just like you don’t have to drink only water because it is legal. It does not affect you. Religion is the scourge of humanity, I am telling you. All of these preconceived notions of what is right and what is wrong based on 3,000 year old morals written in a book that has been translated across dozens of languages into English are so fucked. I am a gay activist (who uses Firefox as his main browser), and I appreciate your contribution to sanity. I’ve been using Chrome as my main browser for quite some time. I prefer it to everything else. I recently bought a refurbished Chromebook which works quite nicely as my traveling unit. And after Mozilla’s recent intolerant action of forcing Eich to resign, I’ve removed Firefox from all my computers. No matter what your stand is on marriage, if you are truly tolerant, you’ll tolerate ALL positions on marriage. Intolerance just isn’t acceptable in 2014. I’m not going to recommend or use a product from a company that wants to be thought police. This is America, where free thought and free speech goes hand in hand. Hey everybody. I quit Firefox when this guy announced his anti gay stance but he’s GONE and I’m back! So just when did he announce his anti-gay stance? You are spreading dishonest information. What he did was donate money to a pro family organization…. Is the role of the internet now to be thought police? Is it Firefox’s place to destroy someone whose views they disagree with? If you think so, raise your right hand at a 45 degree angle, palms out and click your heels. I used Firefox for years but lately it has not been blocking popups. I’ve checked the settings and used several addons including AdBlock Plus PopUp but the damn things keep coming. It’s easier to close and reopen Facebook than to constantly fight the popus so I’ll have to stick with Chrome. the Firefox button and line three give you all you need. as a private citizen. It had nothing to do with a browser. The ACLU should be supporting Mr Eich. I just find it simpler to use. But to each his own! I only use IE if I am forced to by some websites. I stopped using it a long time ago, too annoying. My phone came with Opera and it is fine. How is torch working for you system wise? I had it and it was using over 500MB space and doing stuff constantly in the background I couldn’t identify. I got it from their direct web site, but also found there was limited help on their help pages. I liked it generally but it was such a resource hog. Also Hola managed to get me locked out of my Facebook, because they said I “logged in from an unknown device.” So I got rid of it. I liked the pages and layout but way to heavy for a browser. My inner nerd is showing. Can you run Firefox and/or Google Chrome without Windows XP or do you have to have some from of Windows to run your computer. I DO NOT WANT INTERNET EXPLORER. Thank you for any help you can give me. 2, Firefox vs. Google Chrome. Addition to my previous question above from the Internet Nerd. I am running Google Chrome right now and love it. How do I get rid of Firefox off my computer without it messing everything up like all my files that I have been using for years. See my Inner Geek is showing. Both Chrome and Firefox have Linux versions. You can download Chrome here: https://www.google.com/intl/en/chrome/browser/?hl=en&platform=linux&brand=CHFK and Firefox here: http://www.mozilla.org/en-US/firefox/all/. For your question below, you should be able to uninstall Firefox without any issues. What “files” are you concerned about? Which Browser Are You Gonna Use? Look at who’s politicizing now. You think Firefox is a bad browser because they took a stand on equality? This was an article about the merits of Firefox as a browser, not Mozilla as a company. Besides, which browser are you going to use? I think you’ll find that most tech companies, including Google and Microsoft, support marriage equality. They did not take a stand on equality. Taking a stand on equality from a browser companies perspective is to stay out of political issues. BTW the Constitution has no provision for deciding behavioral decisions are protected by the equal protections clause. The marriage issue is NOT an equality issue, it is a life style issue that people can debate whether to allow or not. It is up to the people, not a browser company. K.T., you say that Firefox has turned around the problem of hogging memory, but I find that it still has a serious memory leak. I track its memory usage on Mac OS X and it constantly increases, even after I close tabs. I have to use the Memory Restart add-on periodically to start fresh. I really wish Firefox would fix this once and for all. When I tested Firefox against Chrome and Internet Explorer for memory usage, I did so with the browsers “fresh”. No add-ons/extensions. Using Firefox overtime, I have noticed that some add-ons exacerbate the underlying problem more. This is true for Chrome as well. Pretty much any browser that allows you to open a bunch of tabs is going to take up some memory and resources, but Firefox is no longer taking up way, way more than Chrome or IE. Remember that closing tabs in browsers where you can undo this action does not necessarily mean the browser will release all that memory back right way. I use Firefox, generally. In combination with the mozilla add-on of http://www.start.me I managed to build the browser I like. How many times must we remind you? I guess that might bother some <shrug>. So K.T. Bradford recommends firefox and Chrome why how much was she paid for these “recommendations”? I ask because Firefox is still bloated and in recent independent test was deemed slowest of the five tested and to quote almost antique. is also harder to remove hang-ons such as yahoo search and ask etc. Chrome while being faster is not the fastest but it does beat firefox in removing the nasties. However popups are another thing even with stop popups ticked certain popups still happen I can’t prove it but I suspect knowing how money grabbing google has become, it would seem that if your willing to pay for popups they will allow them. Being a web designer and working constantly with browers I’m sorry but explorer and safari offer a better user experience and are actually faster then either firefox or chrome. except in the area of fixing up coding in web sites then firefox wins that area hands down it is an excellent diagnostic tool. but for everyday use Ill stick with explorer and one of the main reasons is the way it integrates with one-note a program I use all the time for research. as for speed well I know for a fact one particular secure site I have to log into explorer is 7 seconds faster than chrome and 10 seconds faster than firefox. Oh explorer takes 5 seconds to open it. She was paid about as much as you were for your obnoxious accusation. KT did her own testing for this article and there is a lot more to picking the best browser than just speed. Though other testing articles show Firefox is faster than Safari (http://www.techradar.com/us/news/software/applications/best-browser-which-should-you-be-using-932466) and in some articles as fast or faster than IE. And in my brief experience with the latest Firefox 29, it’s even faster than version 28 that was reviewed in this article. Among the other advantages KT already outlined, Firefox and Chrome were also quick to bring out extensions to automatically test sites for Heartbleed vulnerabilities. Safari and IE extensions were nowhere to be found. So our pick for the best browser remains Firefox. No payment necessary. sorry but my test show different and I’d rather prove it to my self than take someone else’s word. and as for heartbleed vulnerabilities they might have brought out and extension but it is not accurate. So yes I am serious. Safari and IE didn’t need to bring out extensions for heart bleed vulnerabilities as they both use a form of Strict Transport Security STS automatically forces your browser to make a secure connection with every Web page that supports SSL encryption. And in both these browsers cases they were updated before firefox or chrome brought out an extention so testing wasn’t necessary. Heartbleed is a defect in certain versions of OpenSSL that occurs on the server of the site you visit. Forcing SSL doesn’t resolve this (remember, this is a security hole in OpenSSL itself). The site must update their OpenSSL code and (ideally) reissue their security certificates in order to fix the problem. Knowing whether a site has done this will inform the user whether entering private information is safe or not. Chrome and Firefox offered a plugin to do that. IE and Safari did not. Seems to me that you don’t recognize html5, or other website-based popups. As for yahoo search and ‘ask’, get rid of your offending toolbars. KT may have done a lot of testing, but not enough. I didn’t see any mention in the article about the fact that Firefox will not work with Windows 8. I had read that this was the case, but decided to try it anyway. Not only does it not work, but Mozilla is currently NOT working on a version that will work with 8. If you are unlucky enough to have the disastrous Windows 8 system you’re pretty much stuck! Not for Windows 8? Wrong! FYI: I have an HP laptop w/touch screen that came with Windows 8. One of the first things I did was install Firefox. I installed the free Windows 8.1 upgrade and later the Windows 8.1 update. Firefox has been working flawlessly throughout, the same as on my Windows 7 desktop. Each browser has it’s pros and cons. I disagree that Firefox is better than Chrome for several reasons. One example is that Flash freezes up easily in Firefox but not Chrome. As I said each browser has it’s pros and cons, but there is one unforgivable attribute that makes me refuse to use Firefox. Agree or disagree with someones political positions, but a browser company that supports censorship of views they don’t agree with is dangerous. Censoring those who perpetrate bigotry and violence against any innocent minority (snakily justifying their stance as free speech, the American way or “tradition”) is the same as censoring Nazi propaganda. Kudos to Mozilla for taking such a responsible and democratic stand in favor of Marriage Equality. I have used all versions of IE for many years with no problems. Tried FF & Chrome for a while and did not like either one. I also have used Opera and Opera mobile and find it very pleasant to use. I also use Opera on an older pc with Zorin 8 os (Linux based) Linux is still a pain in the a$$ to use but it’s fun to play (waste time) with! I like Firefox, though the new version messed up my app bar and moved my bookmarks button. They claim I can customize it more, but I cannot put the bookmark bar back where it was, it puts it before the forward/back arrows instead of after (where I want it) just before the Navigation bar. That aside I used Chrome and find it is a bit buggy from time to time and does not always update on it’s own. Also it is not as add-on friendly as Firefox. Does anyone use Torch or know why it would use so many resources and memory? I tried it and liked it but it was resource hog and could not find out why, their help pages were…well, unhelpful. But the layout was nice and their theme pages for games and music were very useful. Sadly I had to remove it due to it was using 1/2 gig memory when running and took up as much HDD space for some reason. ...avoid Torch browser like the plague. Based on the numerous irate users posting to this forum.